Jamescita Peshlakai is perfectly happy with her job as an Arizona state representative for District 7. "It's so wonderful to try to fight for something people believe in," she said in a telephone interview last week. 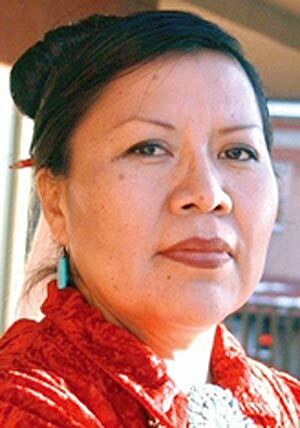 So why is she making a run at the state senate seat now occupied by Carlyle Begay? "He's a nice young man," Peshlakai said of the current senator. "He's super-bright and really charismatic. But as the days at the legislature dwindled down, it just became unacceptable that he would go unchallenged in the primary." The reason, Peshlakai said, is the number of "disconcerting votes" Begay was casting: siding with Republicans on campaign finance laws, for example, and supporting legislation that would allow payday lenders to up their fees. "Who does that?" asked Peshlakai. Then there was Begay's attempt in March to unseat the leadership of the Democratic caucus, which did not sit well with Peshlakai. "It's his first term, and he's not even elected," she said, referring to the fact Begay was appointed last year to fill the unexpired term of Sen. Jack C. Jackson Jr. "What gives him the right to run the caucus?" Peshlakai refrained from calling Begay a Republican plant, as have some liberal political bloggers like Steve Muratore. But she did say "he definitely does not represent the people of District 7," a relatively poor, rural district which tends to be more left-leaning than the rest of the state. Peshlakai also questioned Begay's residency, as did her fellow District 7 representative, Albert Hale, when Begay was first appointed. "I know a judge sided with him (Begay)," she said, "but there's a big difference between having a post office box in your hometown and actually living there. At least the people in my town (Cameron, Ariz.) know who I am." Peshlakai admitted she has not been able to accomplish as much as she would have liked in her freshman term, with Republicans outnumbering Democrats in the house 2-1. However, she said, she has cultivated some valuable relationships with moderate Republicans that will help in future endeavors. "I've gotten a fair foothold," she said. It's possible, she said, to be a "team player" while still upholding "the Democratic principles the people of District 7 believe in." Peshlakai said that, if elected, she will promote responsible economic growth that includes job creation, put community first, and champion environmental stewardship and protection of sacred sites. "My main objective is to see that the people of District 7 get a fair shake in the state," said Peshlakai, who is Tahneszahnii born for Kinlichiinii. "I feel very confident I could be the first woman senator for my district."